The kids are just wrapping up their last day of school (they’ll be home any minute!) and barring any unforeseen playground disasters, I think it’s safe to say we had a pretty good week. 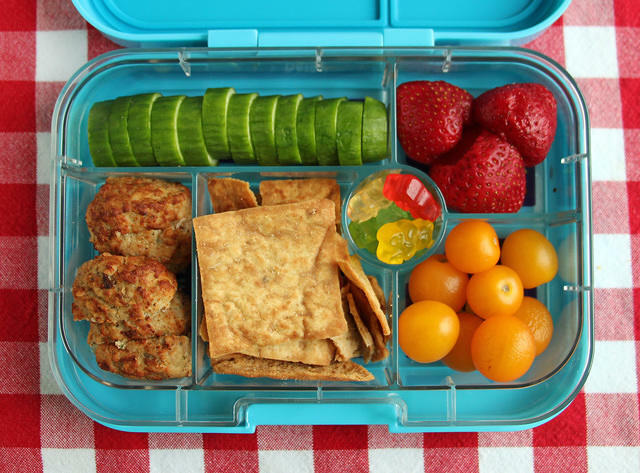 And I think my back-to-school lunch game was pretty strong, if I do say so myself! 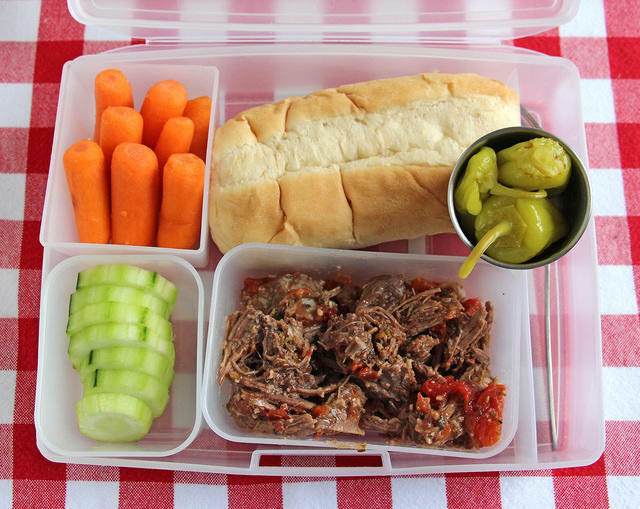 Here are the lunches the kids had this week — along with a few that my husband enjoyed. I already posted about Monday’s lunches. See them over here. The Augster wanted another pretzel Tuesday and he was jealous of Wyatt’s prosciutto and melon from Monday so he had both of those in his lunch along with cucumber sticks and some cookies. A few people have asked where I found the soft pretzels. I found them in the snack area in the freezer section of our grocery store. 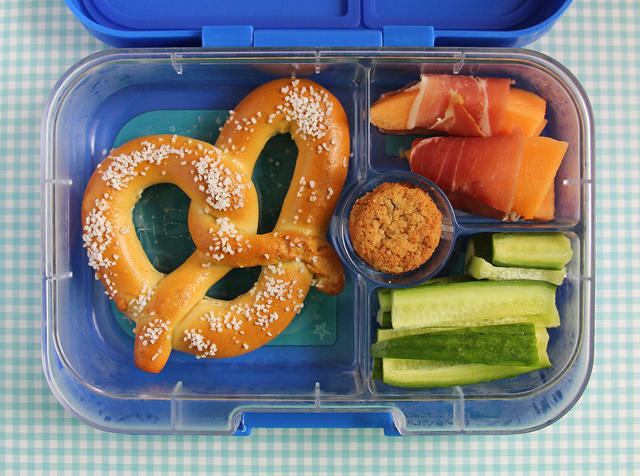 The brand I’ve been buying is SuperPretzel and they are just the right size for lunch boxes. 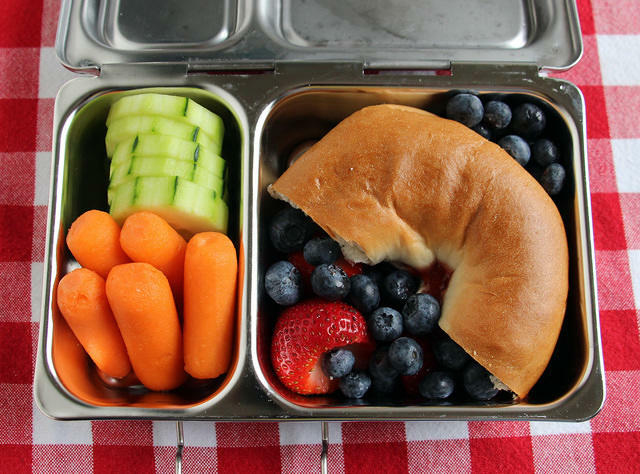 I packed this in our Yumbox Panino. I made my husband, Zach, a grown-up version of a Lunchable for his bento. 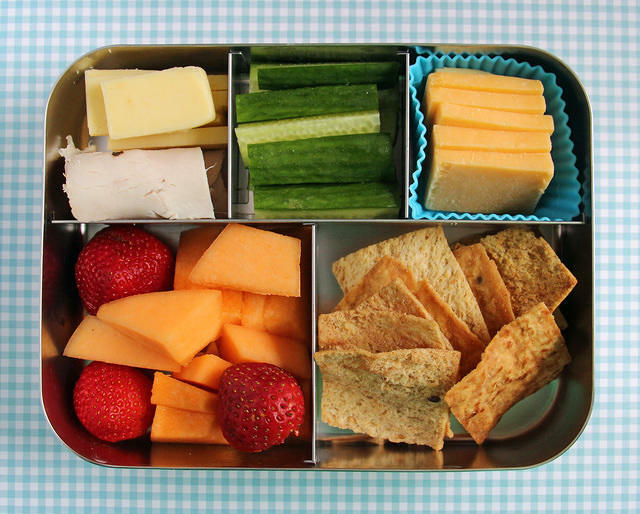 I started by grabbing our big LunchBots Cinco, then filled it with jack cheese, deli turkey roll-ups, cucumber sticks, cheddar, cantaloupe, strawberries and a few whole grain pita chips. We had tacos for dinner on Tuesday (of course), so Wyatt had the leftovers for lunch on Wednesday. 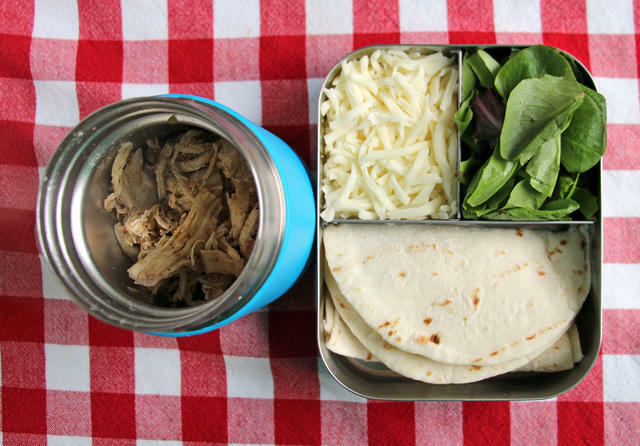 I filled our Hydro Flask thermal jar with piping hot chicken, then packed a LunchBots with the accompaniments: shredded jack cheese, lettuce and street taco sized tortillas. Augie wasn’t into the idea of leftovers, so I went back to basics for his lunch: cucumber slices, strawberries, turkey meatballs, pita chips, yellow tomatoes and a few gummy bears. This was packed in our new emoji Yumbox. SO CUTE! 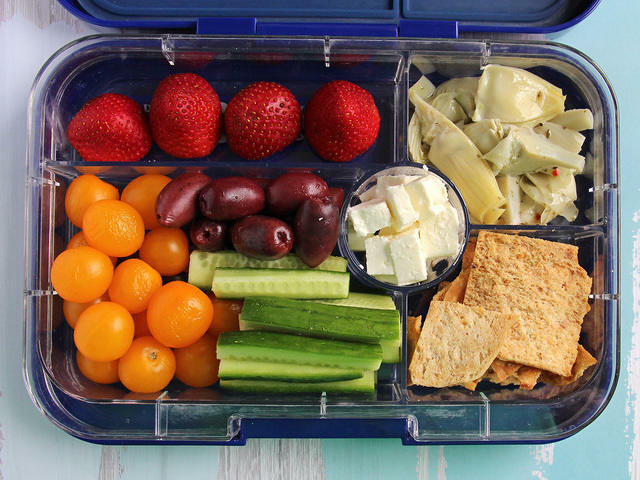 Zach also nixed leftovers so I made him a kind of deconstructed Greek salad in our bigger Yumbox Tapas box: strawberries, tomatoes, kalamata olives, cucumber sticks, feta cheese, marinated artichoke hearts and those pita chips again. This lunch was very well received and Zach texted to thank me for packing it, then thanked me again when he got home. It’s super gratifying to make him lunches because he is always so grateful. I could get used to that…. Augie was super picky about lunch on Thursday and said no to school lunch and the first three main dish ideas I suggested. I was starting to get pretty frustrated but then he asked me for the yellow rice we had leftover from dinner the night before which is a favorite and is very filling. Score! 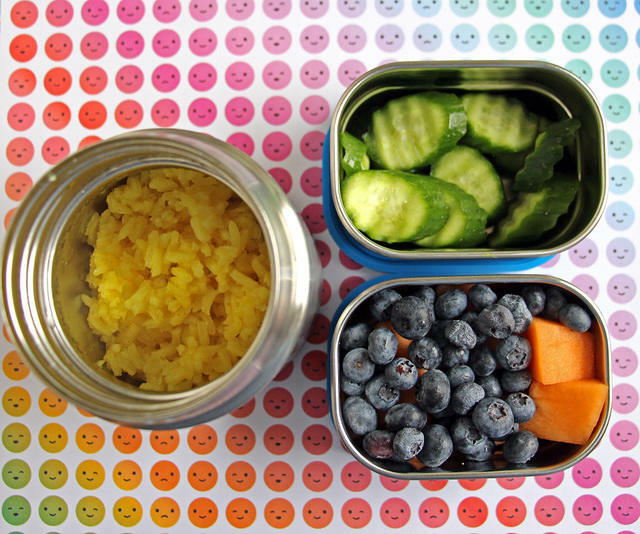 I warmed that up and packed it into our LunchBots thermal jar, then added cukes, blueberries and melon in a couple of Splash Pods. This morning Augie wanted something simple again, so I gave him half a bagel with strawberry jam, some berries, cucumbers and carrot sticks. I packed it in our PlanetBox Shuttle. My eighth grader and my husband had basically the same lunch today. This is my husband’s – I forgot to take a photo of Wyatt’s lunch. They both had leftover Italian beef sandwiches as their main dish. I packed all the components separately so the sandwiches wouldn’t get soggy between leaving the house and sitting down for lunch: hoagie bun with a slice of provolone cheese tucked inside, peperoncinis, and the beef filling. Wyatt doesn’t have access to a microwave so his filling went into a thermos for a nice hot sandwich. My husband warmed his up at work. Packed in a Bentology bento box.